The Korean nation's ssirum (Korean wrestling) was registered as a typical intangible cultural heritage of humanity at the 13th Session of the Intergovernmental Committee for the Safeguarding of the Intangible Cultural Heritage of the UNESCO opened in Mauritius on November 26. 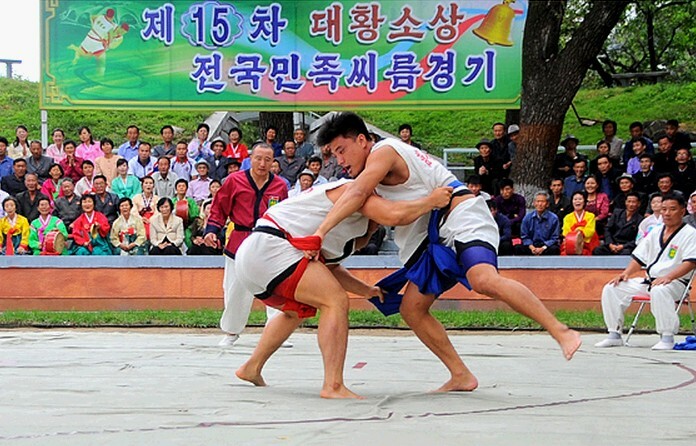 Ssirum is one of the traditional sports events peculiar to Korea. From long ago, the Koreans used to play ssirum matches during recess of labor and on folk holidays. It has been already proved through murals of ssirum tomb and Jangchon Tomb No. 1 dating back to Koguryo Kingdom (B.C. 277-A.D. 668) that the Korean nation's ssirum has a long history. Ssirum was further encouraged in the periods of Koryo (918-1392) and Feudal Joson Dynasty (1392-1910). In Chusok (Harvest Moon Day) and October every year, ssirum contest has been held at the National Ssirum Tournament for Grand Bull Prize and the Inter-Provincial Mass Sports Contest in the DPRK.